Should you be training employees with an online curriculum? You might be surprised to discover the global E-Learning market is projected to reach $107 billion dollars this year (Global Industry Analysts, Inc). This shows many smart businesses are currently using some form of e-learning to train their employees in faster and more efficient ways than ever before. Or, you might already know this and you are looking for a way to convince your boss to invest company dollars in online training formats. 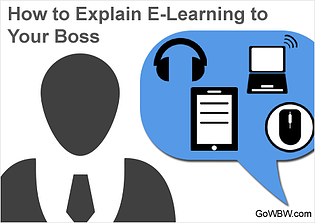 The How to Explain E-Learning to Your Boss article contains key points you can share with your employer to help show the value of online training and just how beneficial it can be for your business.